Ultra Premium (UP) is a new category of olive oil that distinguishes the highest quality olive oil in the world. The UP standard was created in response to the growing need to separate high quality extra virgin olive oils from what dominates the so called “gourmet” and “premium” olive oil markets, as well as the broader category sold in mass markets the world over under thousands of brands and private labels. The absurdly low standards created and fostered by numerous trade associations and government agencies responsible for policing them has only contributed to the confusion and misinformation. EU producers are actually given a perverse incentive in the form of government subsidies to keep their oils in storage until market conditions improve. This practice clearly demonstrates the governmental complicity with retailers and bottlers to sacrifice quality for price. 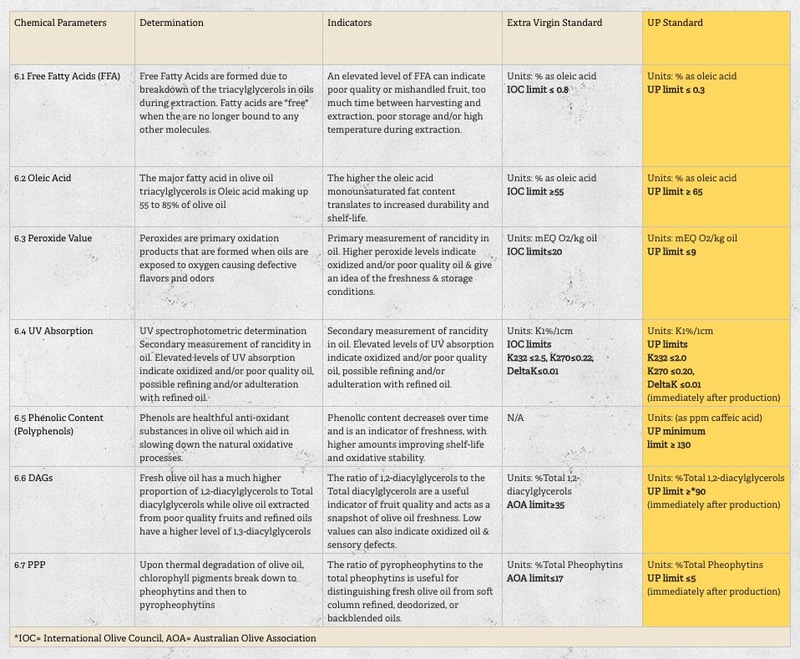 Lack of enforcement and testing by these trade associations and governmental agencies has led to a marketplace dominated by inferior oils and rife with adulteration. These practices by some of the world’s largest olive oil producers and bottlers have led to a steep decline in prices of extra virgin olive oil and are driving quality oil producers out of business.